Jacksonville University senior Nicole Luis is a member of the cheerleading squad, works two jobs and is member and past-President of the Alpha Epsilon Phi sorority. She’s thrived during her time on campus, but her experience may not have been possible without the help of two Jacksonville philanthropists. Luis, of Point Pleasant, N.J., is one of 10 beneficiaries of the inaugural Stein Scholars program. Created by Linda Berry Stein ’69 and her husband, David Stein, the program helps students — who call themselves “Steiners” — earn a college education. The program, however, goes beyond supporting students financially, as Luis described. It’s even more than a mentorship – it’s a program that creates strong connections for students with each other, the city of Jacksonville, and, of course, the Steins. In fact, Luis met her best friend and roommate, current Steiner and Sociology senior Malone St. John, through the program. The Steins say they hope each participant graduates feeling like he or she has strong ties to Jacksonville’s professional world. “If you invest in young people, we hope to introduce them to education and the city of Jacksonville, in hopes their talent will keep them in the city,” Linda Stein said. A native of Savannah, Ga., Linda Stein attended JU right after graduating high school. A Miss Jacksonville University winner, she graduated with a bachelor’s degree in music education. “I have my heart and soul in JU,” said Linda Stein, who also serves on the University’s board of trustees. Since she graduated, Linda Stein has been a tremendous ambassador for JU in the community. She was an Alumni Board of Governors member, co-chaired the JU College of Fine Arts’ 50th Anniversary “CFA Soiree,” and is a Scholarship Student mentor. The Steins’ generosity to the University also includes donations to the University’s four-year-old ASPIRE comprehensive campaign, redevelopment of the River House, the JU Fund, the JU Adopt A Classroom Program, and many other projects that benefit students and the University. 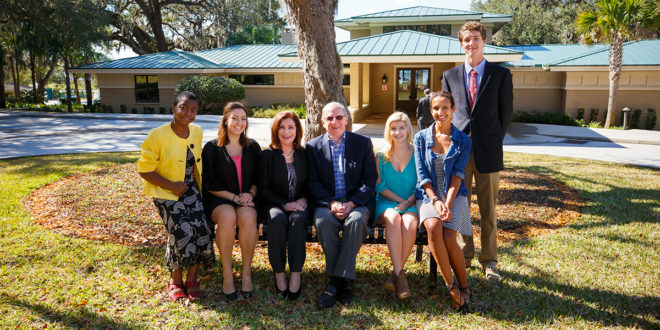 This past fall, Linda Stein received the Jacksonville University Distinguished Alumni Award. The Steins have been married for 26 years, and in that time, Linda’s and David’s philanthropic endeavors have enhanced Jacksonville overall and the lives of many of its residents. Buildings at the Jewish Community Alliance and Greenwood School bear their names to recognize their generosity. Local arts and animal welfare organizations, as well as various nonprofits, have been able to make significant improvements because of the Steins’ donations. Four years ago, the Steins had the opportunity to expand their scholarship reach in the region by creating the Stein Scholars program through the University’s ASPIRE campaign scholarship program. ASPIRE is a $120 million campaign that aims to increase funds to various areas of the University, including advancing scholarships and academics. The Steins’ program was one of the first ASPIRE scholarship programs. Recipients of ASPIRE scholarships receive various amounts of financial support. But some programs under the ASPIRE program provide more than just financial support, and the Stein program is a great example. Members from the first class of Stein recipients, like Luis, were selected four years ago through the University’s Office of Financial Assistance and determined by merit and need. scholarship for four years,” said Kimberly Jones, JU Chief Advancement Officer. The Stein Scholars program stands out because of the connection that is formed among the students and the Steins. Every year, the Steins open up their farm home near the Florida line for a “retreat” with all Steiners from both JU and the couple’s similar program begun in 2000 at the University of North Florida. A facilitator creates games and projects with the Steiners to open up lines of communication. Past outings include annual trips to the Jacksonville Symphony, The Jacksonville Port Authority and Naval Air Station Jacksonville. Steiners have accompanied the Steins to the Jacksonville Mayor’s Office and been connected with local young executives. Each year, the Steins host a holiday party that unites current Steiners with alumni of the program. Current and past participants call the Steins “Mama and Papa Stein,” Linda Stein said. She also often receives Mother’s Day emails and cards from her Steiners. One of JU’s Steiners was Engineering major Jonathan Maywood. Once he graduated from high school in Southern California, he learned he was accepted into JU, and shortly after that he was informed he was selected as a Steiner. Maywood said the Steins made a significant impact on his college experience. Maywood was even able to have a private lunch with the Steins. “Being able to do that and welcome me into their own family was really cool and personally made me want to do what they did and give back to someone else,” he said. With their first class of JU Steiners graduating, Linda Stein said she’s confident her Steiners will be successful after college.